I just got some new Fluffles stamps and decided to use one of them for Mercy's Tuesday Sketch Challenge #28. My base card is Very Vanilla with three layers of paper from Basic Grey's Archaic 6 x 6 pad. This is a perfect card for my brother (who is never seen without a cup of coffee in his hand) so I didn't want any ribbon on it. But it needed something, so I wrapped some russet colored jute around the bottom and added an antique brass brad to each corner. The second element is also 3 different designs of Archaic paper. The focal image was stamped on Stamper's Select White Cardstock with Memento Rich Cocoa ink and colored with Copic markers (see below). It was sponged with Creamy Caramel and matted on two patterns of DP. It also has antique brass brads in three corners and is up on 3M foam squares. 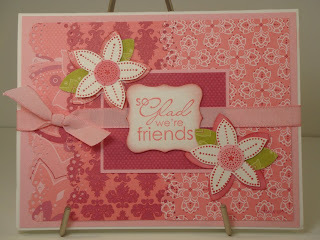 The sentiment is from MFT's set called Sassy Sayings and is stamped on Very Vanilla with Memento Rich Cocoa. It's sponged with Creamy Caramel, layered on DP, and is also up on foam squares. First, just a note to my readers: I got a question yesterday in a comment but I couldn't respond because the reader didn't leave an email address. To remedy this, I've added my email address in the side bar. So, if you have a question for me, please fire it off in an email and I'll answer it to the best of my ability. Thanks! This card is for three challenges--SCS color challenge 203 (Baja Breeze, Pacific Point, and Garden Green), the very latest hot off the press Stamp Simply--#72, show some LOVE!, and Mojo Monday 70--just a little late, LOL, but I like the sketch so I'm doing it. That's my story, etc., etc. This could be an anniversary card, I think. Or a Valentine's Day card. 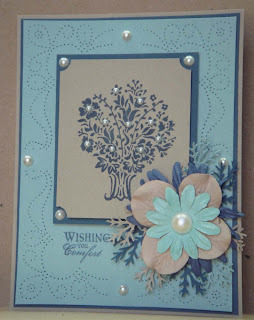 My card base is Whisper White with a layer of Garden Green, then Pacific Point, then a layer of Whisper White that I ran through my Cuttlebug with the Love Language embossing folder. The next "element" is two rows of Pacific Point striped ribbon. 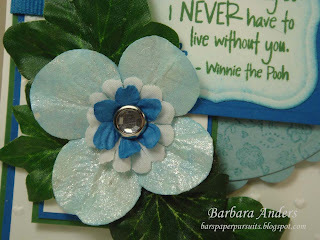 The half-round element is Baja Breeze stamped with my Posy backgrounder stamp cut/embossed with a circle Nestibilities die and layered on Baja Breeze cut/embossed with a scalloped circle die. 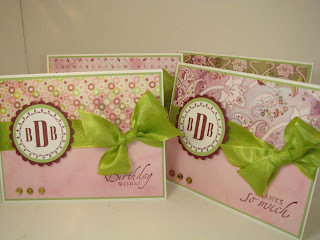 The long element is Garden Green, Pacific Point, and Whisper White that was run through the Cuttlebug with the Stylized Flower embossing folder. These elements are up on 3M foam squares. The focal image was stamped on Whisper White with Garden Green using a stamp from Verve's Beautiful You set--you can't see it but the little flower was done in Pacific Point. It was cut/embossed with a Lables One die and layered on Pacific Point which was cut/embossed with a square die--the edges were sponged with Baja Breeze then Pacific Point. This is also up on foam squares. The "Baja Breeze" Prima was once a white one. I colored it with a Twinkling H2O called Tahitian Blue--which was a little too blue so I went over it with Shimmerz in Mint. It's probably closer to Soft Sky but it works and it sure does shimmer. The flowers are attached with a clear crystal brad. See the green leaves? I bought a miniature ivy garland at Wal*Mart in the floral department for $3.00 and cut the little leaves off. I LOVE how this turned out!! Now I have leaves for, well, let's just say for quite a while for almost nothing, LOL. They're attached with glue dots and match the Garden Green to a "T". This card is for the last Viva la Verve January challenge. It's a sketch with a twist of flowers. I'm always ready to do flowers, and since I just got this retired SU! set called Flower of the Month, I was ready. I really love this set. My base card is Very Vanilla with three layers of cardstock from a K & Co Cardstock Pad called K-ology Hannah, and I added a Dew Drop from the Primary Color bottle in each of the corners.The next element is also all from that cardstock pad and is up on 3M foam squares with a little paper piercing in each corner. The third element is two pieces of satin ribbon that match the card stock. The focal image is the flower for January--Carnation. 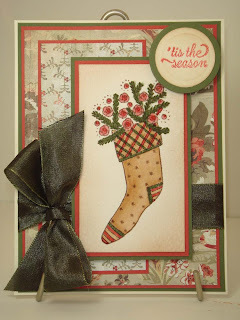 It was stamped on Stamper's Select cardstock with Palette Hybrid Noir Black ink. 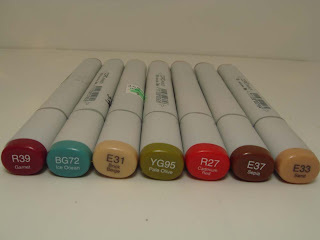 I colored it with Copic markers (see picture below for the ones I used), sponged the edges with Creamy Caramel ink and cut/embosed it with a Lables One Nestabilities die. Then it was matted with card stock from the pad that was cut/embossed as well. The sentiment is from Verve's Wonderful Wishes set and was stamped on patterned cardstock with Basic Black, punched with the small oval punch and matted on more cardstock punched with the medium punch. Both the focal image and the sentiment are up on 3M foam squares. I like the way this card turned out. Each month I'll use the stamp for that month for a birthday card. And I have another project in mind for this set, too. Another Color Throwdown day!!! I just love the color combinations the team members have been coming up with, don't you?? Today's colors were chosen by Cathy Indelicato and are: Basic Black, Real Red, and Brocade Blue. Well, I gotta tell you, these colors shout PATRIOTIC to me! So, since Presidents Day in the US is coming up, I decided to make a patriotic card for today's challenge. This was a fun card to make--simple but pretty elegant, I think. I got the idea for coloring only the flag from a photo a co-worker had of a family member. The picture was all black and white--except the little American flag in a little boy's hand--it was colored red, white, and blue. It was really striking in it's simplicity and meaning. 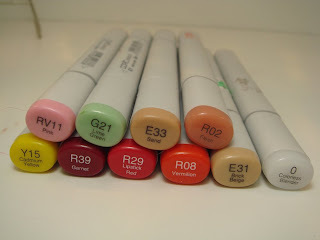 C'mon over to the Color Throwdown blog and play along with us this week. If you upload your card to a public forum, please use the keyword CTD27 so we can see your beauty all in one place. And if you play, you *could* be picked as our Featured Stamper! Hope to see you there! This card is for SCS Sketch Challenge 212--another great sketch. It's also, obviously, an anniversary card. My base card is Very Vanilla, with a layer of Always Artichoke, then a layer of Bashful Blue, then a layer of DSP from the Le Jardin (retired SU!) collection. I've had this for a while and never used it, but I was inspired by a picture I saw in a magazine and immediately thought of this DSP. The next element is more Always Artichoke and Bashful Blue, and another pattern from the collection. The third element is simply Always Artichoke and Bashful Blue. 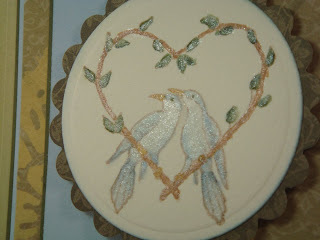 The focal image is from the For the Love of Birds set by Our Craft Lounge. It's stamped on water color paper with Basic Brown and stamped off once since I wanted very soft lines for this image. I then water colored it with Stampin' Up! markers and a blender pen, then went over all the water colored areas with Angel Wings Shimmerz. The picture below shows a close up of the shimmer. It was then cut/embossed with a circle Nestabilities die and the edges were lightly sponged with Bashful Blue. Then I matted it on another pattern of DSP which was cut/embossed with scalloped circle die, and is up on 3M foam squares. The sentiment is from the same set and was done in the same manner, except I didn't stamp off the word stamp. It was cut out with a Designer Label punch, sponged with Bashful Blue and matted on more DSP cut out with the Large Oval punch. It's also up on foam squares. A few blue rhinestones in strategic places finish the card off. 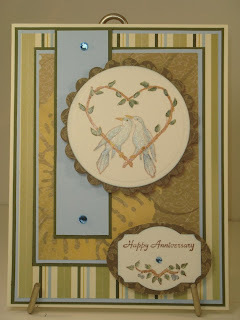 Don't you just love the Verve sentiment stamps? I do, and hope to get some new ones soon. This card is for SCS Color Challenge #202: Bravo Burgundy, Regal Rose, and Kiwi Kiss. Great combination. I started flipping through my Basic Grey paper pads and saw that Eva fit the bill with the colors. I love this collection. This card is also for Mercy's Tuesday Sketch #27. My base card is Whisper White with a layer of Bravo Burgundy, Kiwi Kiss, and finally, a layer of the Eva DP. The next element is the same with different DP. I tied a bow around all this with striped Kiwi Kiss ribbon. The sentiment is from Verve's Beautiful You set and is stamped on Whisper White with Bravo Burgundy. It--and the Kiwi Kiss layer--is cut/embossed with oval Nestabilities and the Bravo Burgundy layer is done with the scalloped oval dies. This element was attached with 3M foam squares and a Fresh Cut Grass Dew Drop was added as an accent. Another new to me set from MFT. I just love these stamps! This card is for Papercraft Planet's sketch for January 17. I'll get it uploaded there sometime, LOL. I like this sketch--I'm sure I'll use it again. 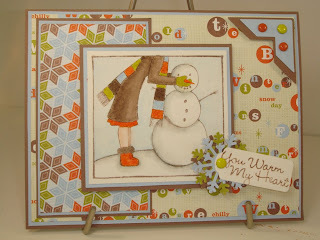 My base card is Close To Cocoa with a layer of Bashful Blue then a layer of Frosty Day DSP. By now you've probably figured out that I like lots of layers, LOL. I like this DP a lot. It's a good winter set without being Christmas, and I think this one could qualify as a non-traditional Valetine's Day card. The next element is the same, with different DP. The focal image is from the Baby It's Cold Outside set. 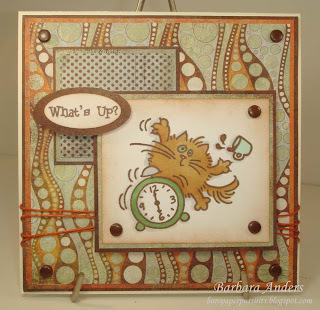 I stamped it on watercolor paper with Basic Brown and colored it with Stampin' markers, reinkers, and a blender pen, then popped it up on 3M foam squares. The sentiment is from the same set and was stamped on watercolor paper with Basic Brown and attached to three punched snowflakes with a brad--also attached with a foam square. The upper right corner looked kinda bare, so I added photo corners with some brads, also up on foam squares. This image was fun to play with--looking forward to doing it in different colors. This gift box of note cards is for a very dear friend. I got the idea a couple of weeks ago from a card I made for a challenge. I guess I'm CASEing myself, LOL. All of the base cards are Whisper White with a layer of Certainly Celery. 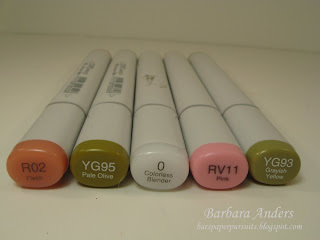 Then they each have a different DP from Basic Grey's Eva 6 x 6 pad along with the pink solid included in the collection. A celery green ribbon was tied around, where the papers meet, in a bow. I stamped the monogram with Just Rite's 1 5/8" round Harmony stamper, the Brayton Font and a border from the 10 Designer Centers and Borders set on Whisper White with Bravo Burgundy ink. The monogram and the layers were cut out with large and small circle and large scalloped circle Nestabilities dies and the whole thing was mounted on 3M foam squares. Each sentiment, stamped with Bravo Burgundy, is different and all are from SU! 's Sincere Salutations set. Three Fresh Cut Grass Dew Drops balance the left lower corner. After they were done, I put them in a clear box and tied a rich burgundy ribbon around it. Pretty simple, but very pretty, too, and easy and quick. You can't get any better than that. I think my friend will like the set. Well, it is if you're in the Christmas Card Challenge at SCS, LOL. This card is for that and Mercy's Tuesday sketch #26. Yeah, I'm still behind. But, I really LOVE this sketch so I'm doing it. Do check out Mercy's sketches--they're always great. My base card is Very Vanilla with a layer of Always Artichoke, a layer of Ruby Red, and a layer of DP from Basic Grey's Wassail 6 x 6 pad. 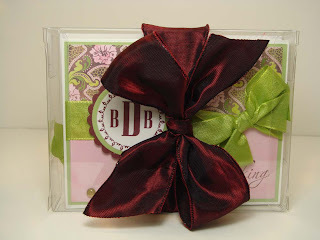 The next element is Ruby Red with another pattern from that collection and a ribbon and bow is tied around on top of it. 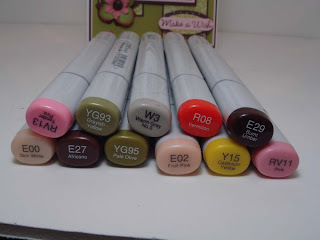 The focal image is a Karen Lockhart stamp that was stamped on watercolor paper with Basic Brown, and water colored with Stampin' markers and a blender pen. I then heavily sponged the edges with Creamy Caramel. It's layered on Ruby Red and Always Artichoke and is attached with 3M foam squares. The sentiment was stamped on Very Vanilla in Ruby Red with a stamp from Martha Stewart's Clear Christmas Tree set. It was cut/embossed with circle Nestablilties, sponged with Creamy Caramel, and matted on Always Artichoke mat. It's also up on foam squares. 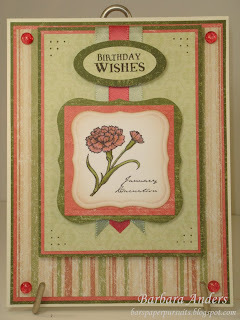 I love the vintage feel of this paper--it reminds me of old-fashioned wallpaper. I love this card--hope you do too! 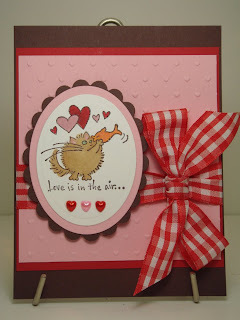 This card was made for the third January Viva la Verve challenge--with a twist of PINK. Yeah, it's almost late ;-) But it's a great sketch so I had to do it. My base card is Whisper White, with a layer of gold metallic card stock, then a layer of DP from The Sweet Stack from DCWV. The next element is gold, then Ruby Red and is up on 3M foam squares. 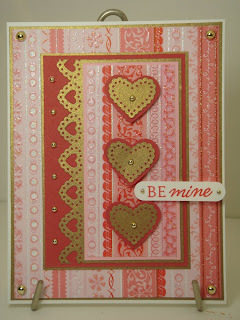 The focal element is first gold card stock on which I used a Martha Stewart heart border punch, then a layer of Pirouette Pink, then another layer of DP. Three hearts, both layers of which were punched with a different Martha Stewart heart punche in Ruby Red and gold were adhered with 3M foam squares. The sentiment was stamped with Ruby Red on Whisper White with a stamp from Papertrey Ink's Heart Prints set. It's also up on 3M foam squares. Three sizes of flat back gold beads accent in different places. This card is for Color Throwdown #26. Broni Holcombe chose these colors and I think they're just fantastic together: Basic Black, Kraft, and Pink Passion. Pink Passion is a "strong" pink so I wanted to keep it to a minimum but still be a major part of the design. I think I achieved that goal with this card. My base card is Basic Black with a layer of Pink Passion and then Kraft. 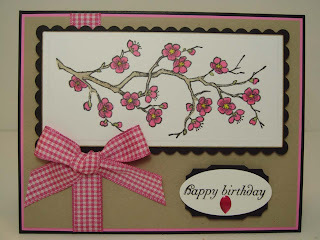 The focal element is an unknown stamp from a craft store--looks like cherry blossoms to me. It's stamped on Georgia Pacific card stock with Memento Tuxedo Black ink, since I planned to color it with my Copics (see markers that I used below--I used W3 and E31 to make Kraft). It was then cut/embossed with long rectangle Nestabilities die, as was the black mat. I also ran a line from a gold paint pen around the edge of the image panel to give it a little more definition and popped it all up on 3M foam squares. The sentiment was stamped with a stamp from PTI's Birthday Basics on Whisper White with Basic Black ink and punched out with a large oval SU! punch. It was layered on Basic Black that was punched with the Designer Label punch which was trimmed a little on the top and bottom to make it fit in the space better. A little hot pink "gem" was added and then it was popped up on 3M foam squares. The pink gingham ribbon and bow finish it off. 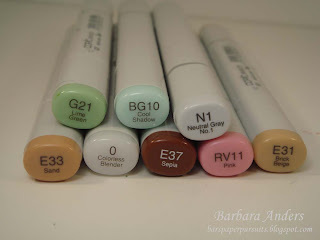 C'mon over to the Color Throwdown blog and play along with us this week. If you upload your card to a public forum, please use the keyword CTD26 so we can see your beauty all in one place. This card is for No Time To Stamp's Stamp Simply challenge #70: Senior Citizens Rule! Sharon's birthday was on January 16th and for this challenge one is to make a card that will appeal to a senior citizen--all in good fun! My base card is Kraft (love it!) with a layer of Old Olive, a layer of Blue Bayou (retired In Color), and DP from Making Memories called Kraft Mixed Dot. The focal image is from Papertrey Ink's Quilter's Sampler set and is stamped on Neenah Solar White with Memento Rich Cocoa ink and colored with Copics (see picture below for colors used). I then sponged the edges pretty heavily with Close To Cocoa, used the corner rounder punch on it's corners and on the Old Olive layer and then matted it with Blue Bayou. It was attached with 3M foam squares. The sentiment is from the same set. 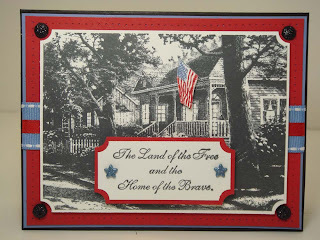 It was stamped on the same paper with Blue Bayou, sponged, matted with Blue Bayou, and is also up on 3M foam squares. A little quilt square from PTI's Quilter's Sampler Additions is popped up on the corner of the sentiment. A Blue Bayou double stitched ribbon was added with a button from my stash tied on with waxed linen thread. 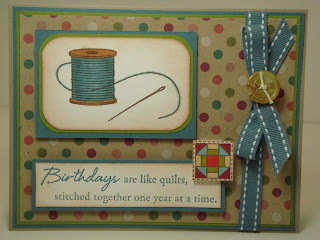 With it's vintage feel and the quilt theme going on, I think a senior citizen would like this card, don't you? This card is for Mercy's sketch challenge #25--just a wee bit late ;-). But that's OK, it's a great sketch and it was fun to do. It also qualifies for CCEE Stampers' challenge today: use a fish or fish lips on your card. I've been wanting to do this little Fluffles stamp and this was a perfect sketch with which to use him. My base card is Chocolate chip, the next layer is Real Red and the next is Pretty In Pink, run through my Cuttlebug with the Love Language folder. The focal image was stamped on Papertrey Ink's Stamper's Select White Cardstock with Chocolate Chip craft ink and heat embossed with clear embossing powder (I tried several times with Momento ink and the fish kept bleeding outside the lines!). 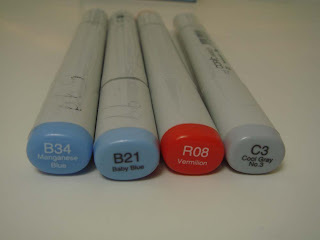 It was then colored with copics (see below). Then it was cut/embossed with an oval Nestabilities die and matted on Pretty In Pink and Chocolate chip. Three flat-backed hearts accent the bottom of the A 1" red gingham bow (I love the big ribbons and bows!) finishes it off. The focal image is up on 3M foam squares. 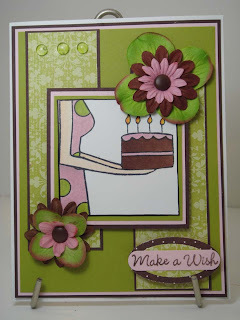 This card is for SCS sketch Challenge 211. Great sketch-it was fun to play with. I used a new (to me) MFT set called You Take the Cake. I've always loved it and finally got it! My base card is Whisper White with a layer of Chocolate Chip then a layer of Pirouetted Pink, and a finally a layer of Kiwi Kiss. The next two panels are first Chocolate Chip then DP from the Bella Rosa DSP pack. The focal image was stamped on Neenah Solar White paper with Memento Tuxedo Black ink and colored with Copics (see picture of the colors I used below). It was then matted on Kiwi Kiss, Pirouetted Pink, and Chocolate Chip and is up on 3M foam squares. The sentiment is from the same stamp set and was stamped on Pirouetted Pink with Chocolate Chip ink and punched with the Word Window punch. It's layer on two designs from the Bella Rosa DSP punched with the Large and Small Oval punches and is also up on 3M foam squares. Two sets of Primas follow the sketch and are attached with brown brads. Three clear Dew Drops on the upper left provide balance. This card is for SCS Color Challenge #201: Not Quite Navy, Baja Breeze, and Kraft. A very pretty combination. It's also a sympathy card. Unfortunately, we need one of these occasionally, and I thought these colors were very soothing and it won't hurt to have one on hand. My base card is Kraft, with a layer of Not Quite Navy, then a layer of Baja Breeze with a good deal of paper piercing using a new corner template I got from Ellen Hutson's store, and embellished with flat backed pearls. I really love how this turned out. The focal image is first Not Quite Navy (love that color! ), then Kraft with an image stamped from Flourshes' set Thinking of You in Not Quite Navy. Both layers are embellished with flat backed pearls and each layer is up on 3M foam squares, The sentiment, also stamped in Not Quite Navy, is from (what else?) Verve's Wonderful Wishes set. Prima flowers and punched leaves in the challenge colors balance it all. This card is for Mojo Monday 69. I'm actually getting it done before the next one comes out, LOL. Great sketch, as always. 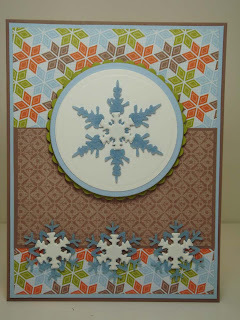 My base card is Close To Cocoa, with a layer of Bashful Blue, then a layer of Frosty Day DSP. I got this paper when it first came out but this is the first time I've had a chance to use it. Really pretty! The next element is Close To Cocoa with another pattern from the collection. The focal element is Whisper White, Bashful Blue, and Kiwi Kiss, all cut /embossed with my Cuttlebug and Nestibilities dies. The blue felt snowflake is attached with a white snowflake brad. The whole thing is up on 3M foam squares. The lower elements are more felt snowflakes and snowflake brads, following the sketch. This was a fun sketch and fun paper to work with. No stamping/coloring means it was quick, too! Whew! This card combines three challenges! 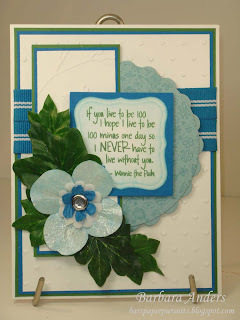 Viva la Verve #2 (sketch with a twist of bling), No Time To Stamp #69 (It's Still Winter), and Our Creative Corner (two shades of blue with a neutral). Well, no stamp set could do these better than Verve's Snow Wonderful, IMO. All images on this card are from this set. My base card is Whisper White, with a layer of Basic Black, a layer of Bashful Blue, and finally a layer of Whisper White that I ran through my Cuttlebug with the Snowflake folder. 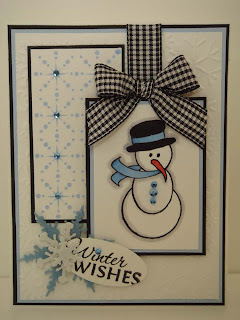 The next element is Basic Black and then Whisper White, on which I stamped the snowflake border in Bashful Blue. The bling starts here :) The next element is Basic Black, Bashful Blue, and the focal image using Neenah Solar White paper. 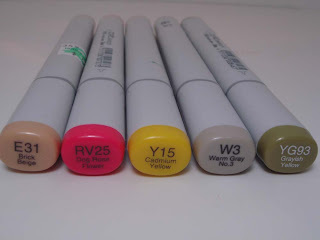 This is my first foray into Copic coloring. I know, it's just a teeny tiny bit, but it's a start! And I think it's OK for a first attempt, but I think I need a lighter gray for outlining. I stamped the snowman in Memento Tuxedo Black ink and colored hin with two shades of blue (see picture of the Copics I used below); his buttons add more bling. This element is popped up on 3M foam squares. The sentiment was stamped on Whisper White with Basic Black, punched with a SU! large oval punch, and is attached to two felt snowflakes with a glittery snowflake brad. One more blue rhinestone dots the Winter "i" and black gingham ribbon completes the sketch requirements. I love this card and I hope you do too! Better put on your shades! Happy New Year and fabulous news!